Narayanaswamy Jayaratnam Kalutara Roving Correspondent and H.L. Sunil Santha Kalutara central special corr. Vietnam Youth Chess team accomplished three gold, four silver, medals, and two bronze medals and was crowned as the overall champions in their Asian Youth Chess championship. Uzbekistan won three gold, one silver medal and emerged runner-ups. Placed third in the championship, India bagged two gold, four silver, and two bronze medals. The event was held recently at the Citrus Beach Resort, Waskaduwa. The contest was organized by the Chess Federation of Sri Lanka on behalf of the Asian Chess Federation and the World Chess Federation, under the guidance of the vice president of Asian Chess Federation, Secretary of Commonwealth Chess federation Luxman Wijesuriya, secretary of the Sri Lanka Chess federation Budhi Panagoda and the Sri Lanka Asian Youth Chess organising committee. The tournament consisted of 570 competitors under the categories 8,10,12,14,16 and 18 Girls' and Boys' open standard chess, open Rapid and open Blitz) from 23 counties Australia, Bangladesh, China, Hong Kong, Indonesia, India, Iran, Japan, Kazakhstan, Kyrgyzstan, Malaysia, Mongolia, New Zealand, Philippines, Singapore, Sri Lanka, Syria, Thailand, Turkmenistan, Chinese Taipei, United Arab Emirates, Uzbekistan and Vietnam. 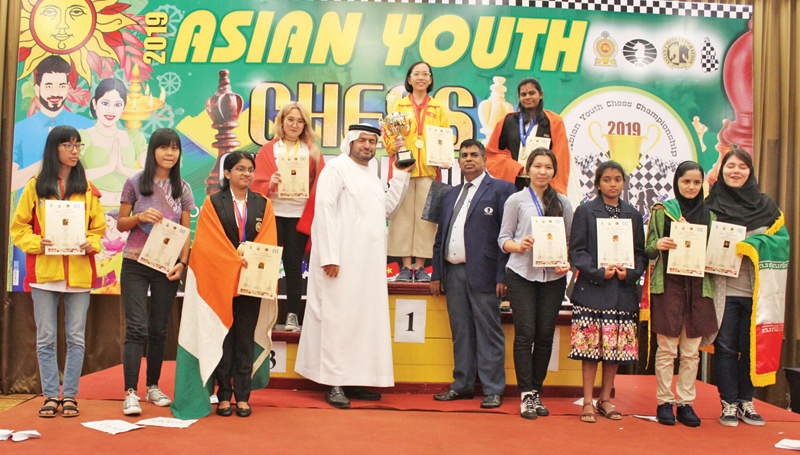 General Secretary of the Asian chess federation Hisham Al Taher was accompanied as the chief guest at the final and awarded the certificates, medals, and trophies to the winners. Deputy president ACF, president Commonwealth Chess Association Barath Singh Chauhan, FIDE representative - representing FIDE president advisor to the FIDE Bent Balagabaev, the chairman of Sri Lanka tourism development Kishu Gomes also graced the closing ceremony. 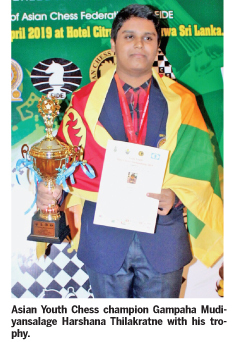 It is noteworthy that the Kurunegala Maliyadeva Vidyalaya student and highest international rated (2417) IM norm completed in national 2nd place in 2018, Gampaha Mudiyansalage Harshana Thilakratne won the gold medal in under 16 open blitz event and under 18 open standard event silver medal, by the end of the tournament (final ranking after 9th round) Sri Lanka retained the ninth place.